Respectful, caring touch is essential to healthy human life and development. 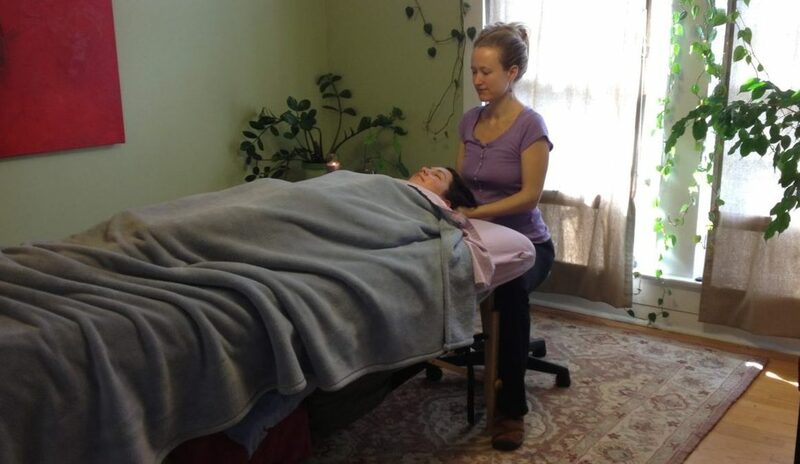 It is my joy to share the time-honored healing benefits of bodywork and energywork directly with individual clients and as a facilitator of partner and group learning experiences. Currently all my individual sessions are clothes-on. Depending on your needs and intentions, clients can choose between two styles of session: polarity therapy on the table or barefoot bodywork blended with polarity therapy on the floor (read below for more details on each modality). Our time together can also include: yoga exercises for home and office, affirmation card creation, stress reduction skills, breathing exercises, identifying additional self-care resources, goal setting, or simply resting and receiving. I see clients at the historic Nooe House in downtown Pittsboro, 224 East Street, Suite G. Payment installments are available to support affordability. Cash and check are the preferred methods of payment. I primarily offer 75 and 90-minute sessions for $95 and $110, respectively. Each session includes about 10 minutes to: review your health history and observe your current state of being prior to hands-on work, and a brief check-in afterward to assist with integration. In the coziness of my beautiful treatment space, learn how to easily give a relaxing massage using your hands (and feet if you wish to share more pressure without taxing your hands and shoulders). I will guide you and a friend, spouse, family member or partner through giving and receiving nourishing touch, personally tailored to your needs. Receivers are fully clothed and resting comfortably on a mat on the floor (which is easily recreated at home). 2 hours recommended minimum length. 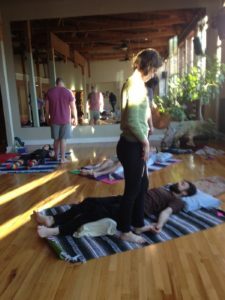 Couple goes home with written massage flow to consult for ongoing practice. Great gifting idea for mothers and fathers day, birthdays, anniversaries and other celebrations! Contact Kim for scheduling. Purchase online gift certificate here. I offer community workshops on massage and polarity therapy for participants of many ages. In a Partner Massage Playshop, I guide partners through giving and receiving an easy, therapeutic, fully-clothed massage. Receivers lie comfortably on blankets on the floor, while givers use healthy body mechanics to rock, stretch and compress their partner. Participants go home with tools for sharing the healing art of massage with other friends & family. Playshops usually last 2.5 hours, and people sign up with a friend, family member or significant other. We review communication skills for giving and receiving touch and usually warm up with a brief partner yoga sequence. Currently offered around Valentine’s Day, check my events page for the next playshop. Contact me if you would like to organize your own Partner Massage Playshop for your group or family. I believe in each person’s innate self-healing ability. I am honored to support you in connecting more fully to the natural wisdom, wholeness, and health of your body. My compassion, respect, and delight in all people is evident in every one-of-a-kind session or workshop. People who benefit from my approach: folks in need of deep relaxation and restoration to nourish and revitalize the nervous system, those in times of transition who want the wisdom of their body to guide resolution and integration of changes, people interested in increased awareness and ease in their bodies (can be enhanced with one-to-one yoga instruction as part of session). I grew up in a family that shared lots of healthy hugs and exchanged frequent shoulder and neck massages, encouraging my innate healing touch from an early age. I also experienced the pain and confusion of non-consensual touch as an adolescent, and receiving professional massage and polarity therapy played a huge role in my adult healing journey. The miraculous experience of providing massage to my sister during her 36-hour labor was the final catalyst for beginning my professional bodywork training, the very next month. Since graduating from the Body Therapy Institute in 2003 as Licensed Massage & Bodywork Therapist #4361, I have studied and incorporated additional healing modalities, including five years of Polarity Therapy training, the year-long Mind Body Spirit Yoga teacher training, and introductions to Reflexology and Thai Massage. For fourteen years I’ve been blessed to share bodywork and polarity therapy with hundreds of clients. Polarity Therapy is the art and science of balancing the natural electromagnetic energy which is the foundation for our physical, mental, emotional, and spiritual selves. As a Polarity Therapist I view the flow and balance of energy in the body as a foundation of good health. The human energy field can become blocked or imbalanced by everyday stress and various forms of unresolved trauma. In a typical Polarity Therapy session, I work together with clients to address physical, mental and emotional energy blocks by creating a safe and supportive environment. In this holistic approach, I blend therapeutic touch, movement exercises, and dialogue that facilitates self-awareness and the building of internal resources. Polarity Therapy works with a client’s natural self-healing abilities to harmonize the energies of the body. No oil or removal of the clothing is required for this sometimes subtle yet profound process. The results of Polarity Therapy sessions vary, and may include: profound relaxation; increased body awareness; greater clarity, openness, and creativity; plus relief from specific health challenges (ie, anxiety attacks and breathing difficulties). What is Barefoot Body Massage? With my feet I can easily share as much pressure as folks wish while they rest fully clothed on a cushioned mat on the treatment room floor. Compression and rocking can be delivered with broad or focused pressure depending on which part of my foot I am using and where it is meeting your body. Passive stretches are woven in as appropriate and can feel like receiving an enlivining yoga pose. Drawing from Thai massage, Shiatsu, Trager, and Polarity Therapy, it’s a very grounding, relaxing, and organic modality to receive. see here for kind words and praise. Give the gift of PARTNER massage! Personalized clothes-on massage instruction for you and a friend. Purchase a 2-hour session here.